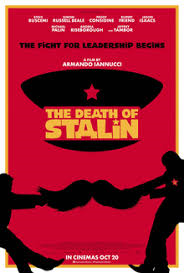 Review: Follows Stalin’s last days and portrays the chaos of the government after his death. This is a story which I knew nothing about. Adapted from a French graphic novel by Fabien Nury and Thierry Robins. The script was well written and well thought out. There are some brilliant one liners in this that make you laugh out loud. I wanted to remember them all but there were far too many. Watching the trailer for this does make you think that it is a laugh out loud comedy all the way through but it isn’t. It is a little misguided. There are some very bleak, disturbing and distressing images. This did remind me of Terry Gilliam’s Brazil (1985). I have not seen any of Armando Iannucci’s work before but was really impressed with his work on this film. He has done so much work with directing the actors. Such an outstanding cast. Just to name a few, Michael Palin was brilliant and I want to know why he hasn’t done more work like this in his career. Paddy Considine also gives his career best performance as the radio producer. When Jason Isaacs comes on the screen the whole film changes completely. You feel safe and you know you are in good hands. I found myself still thinking about this film days after I had seen it. Just last month (September), a high ranking official in the Russian Ministry of Culture announced that the Russian authorities were considering putting a ban on the film in their country. I do hope to see this film get a few Oscar/Bafta Nominations.